The best time to prepare for a hurricane is before it ever happens. With hurricane season officially starting on June 1st and running through November 30th, it’s a good idea to get prepared now. There are a number of precautions you can take beforehand to help you be better prepared to handle the threat of a possible hurricane in your area. Make sure you are aware of the weather. Listen to your local radio or television frequently and stay informed about changing weather conditions. Then you can take a few simple steps ahead of time to protect and secure your property. While permanent storm shutters offer better protection for windows, you can board up windows with 5/8 “ marine grade plywood that has been pre-cut to fit your windows so that it will be ready to install if necessary. Remember that tape will not keep windows from breaking. Secure all outdoor furniture, trash cans or other objects that could become dangerous projectiles in high winds that normally occur during a hurricane. 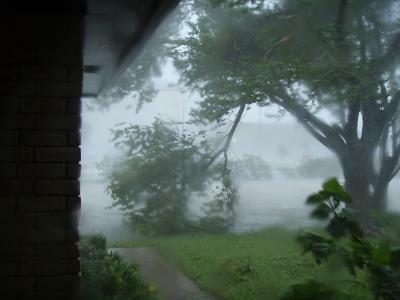 Check your trees for any limbs that could possibly damage your home should they suffer wind damage from a hurricane. Water sources often become contaminated after a hurricane. Be prepared to have a supply of water for drinking, cooking and sanitary purposes such as cleaning and flushing toilets. Be ready to fill the bathtub or other large containers with water if necessary. 1. Stay inside during the hurricane. Most any type of loose object will become a dangerous projectile in the high winds associated with a hurricane. 2. Stay away from windows and glass doors during a hurricane. 3. Brace all exterior doors securely. Make sure all doors on your garage or storage buildings are also properly secured. 4. Don’t be fooled into thinking the storm is over if there is a lull. It may be only the eye of the hurricane and you could find yourself exposed to the forces of the hurricane as the eye passes. 5. Be prepared to take refuge in a small interior room or closet if necessary. Don’t wait until a hurricane is knocking at your door to get ready. With the increasingly dry weather conditions continuing to affect Texas, it is vital that you keep up to date with the most current drought conditions in Texas. There is a Drought Impact Report for all the counties in Texas available from The National Drought Mitigation Center. It includes information on the effects on agriculture, number of fires, effects on water and energy, effects on the environment as well as social and other effects of the drought currently affecting our state.